L’Auberge Carmel, a member of the prestigious International Relais & Château Hotel group, is located on a quiet street in the heart of Carmel-by-the-Sea, California. 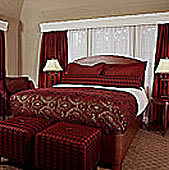 It is a charming, romantic, luxury inn with a European country character coupled with European professional service. Intimate and cozy, it has just 20 discretely appointed guest rooms and a superb young chef some of the best cuisine in California. It is built in a square "donut" shape around a sunny, brick paved terrace filled with tables and chairs, benches, fountains and a forest of pots of flowers. The experience itself starts with the "carriage house" ambience of the three story facade all in white with green trim, shutters and doors. The lounge/reception as well as the "Aubergine" restaurant, have large glassed in old style "carriage" doors that establish the old world feeling and let sunlight flood into the rooms. As you enter, the small 12-table dining room with its whimsical art on the stone walls lies to the right while the small public rooms are to the left. As you pass through the pub-like bar complete with flickering fireplace, you arrive at the lounge and reception where you are greeted with warmth and a refreshing libation as you check in. Here there are comfortable lounge chairs, settees and a "do it yourself" steamer truck "on safari" style bar, country wide newspapers and more. A couple steps down from reception is the 4500-bottle wine cellar that doubles as a lovely conference room lined with beautifully finished glass doored wine "caves". Thus the public rooms line the front of the building and the bedrooms rooms then form the upper floors and other 3 sides of the building all accessible from the courtyard. 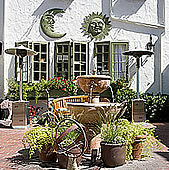 A complete renovation of this historic Inn (built in 1929) was completed in August 2004, making L’Auberge Carmel one of the "village by the sea’s" few full service inns offering guests valet parking, room service, a world class restaurant on premises, and highly personalized guest services. Every little detail is considered important. While maintaining the authentic look and feel of the rooms (down to the original glass and brass door knobs), the owner David Fink and his wife Kathleen Fink scoured Europe for the most sumptuous fabrics and handsome antiques that grace all of the public spaces and the rooms. Some of the upper floor rooms facing west even offer a peek of Carmel Bay on a clear day. Thus the public rooms line the front of the building and the rooms then form the upper floors and other 3 sides of the building all accessible from the courtyard. The only thing it cannot offer due to the limitations of space is a pool and spa. But these days while those features are often desirable, they are not essential to a five star rating. 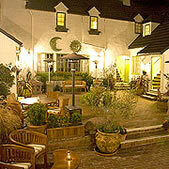 This is a luxury hotel and service and the restaurant is superb and small enough to ensure fine and personal service. L’Auberge Carmel is located just steps from the galleries of Carmel-by-the-Sea, one block from Ocean Avenue on Monte Verde Street at Seventh and four blocks from world famous Carmel Beach. This quaint village has a population of just 5,000 residents not counting the raccoons.